A cruiseship passes by the mountainous landscape that shines in the sunlight off Northern Vancouver Island in British Columbia, Canada. 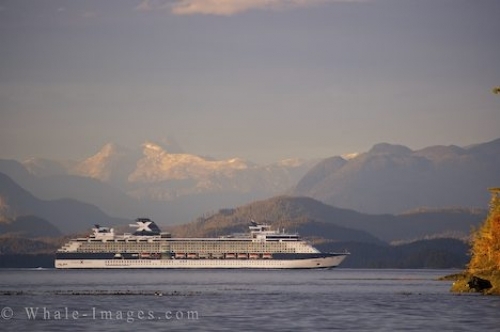 A cruiseship is a common sight in the waters off Northern Vancouver Island in British Columbia, Canada especially during the months from May to October. On the way to Alaska, they travel through the straits and channels off Northern Vancouver Island where you are surrounded by beautiful scenery as you pass fisherman, kayakers, whale watchers and a wide selection of marine life. Johnstone Strait off Northern Vancouver Island is a main marine route and each cruiseship that journeys this way lets passengers see what a stunning area it is. The pristine wilderness, small Indian communities and unique towns are what makes cruising through these waters exceptional. Aboard each cruiseship there are comfortable staterooms, casinos, bars, lounges, pools and an endless list of activities to keep passengers entertained. Most of the cruises run for seven to ten days with stops at different ports along the way. When in a small boat in Johnstone Strait and a cruiseship passes by, you get a good look at how massive these ships are. Cruiseships are an amazing way to travel and see the countryside as you relax and enjoy all the amenities that are offered. Each cruiseship has a variance in their ship and some are more geared to families while others are meant more for couples and seniors. Be sure to do your homework before booking your cruise to ensure that their needs meet what type of cruise you are looking for.